This collection was inspired by handmade Mexican peasant dresses. We love the bright, beautiful hand stitched flowers. 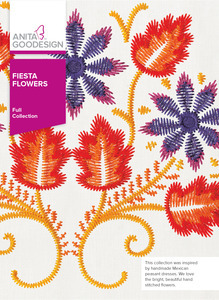 This collection was inspired by handmade Mexican peasant dresses. We love the bright, beautiful hand stitched flowers. 20 different designs in multiple sizes (hoop sizes 7” x 111” and 8” x 12”). 60 isolated designs in 2 sizes each (hoop sizes 5” x 7” and 6” x 9”). All you need to do is stitch them with standard 40 weight rayon or polyester thread and we do the rest. There are over 20 different large flower arrangements in multiple sizes as well as dozens of small ones so you can decorate any garment. 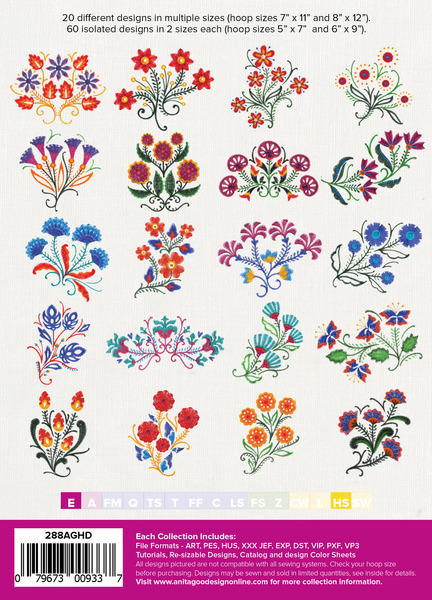 When we digitized these flowers, we used a technique that looks like they were stitched by hand. You will be amazed when you stitch these designs.